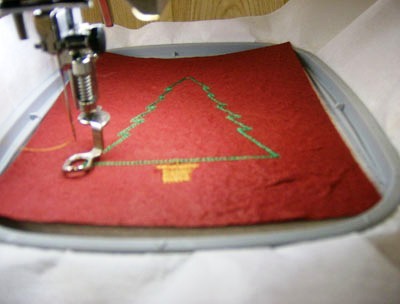 Stitching on paper is really fun and easy to do once you know the basics. 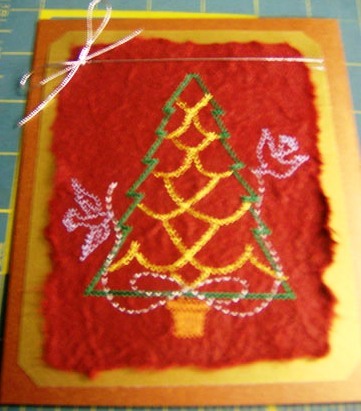 To create this holiday card, I used thick mulberry paper. 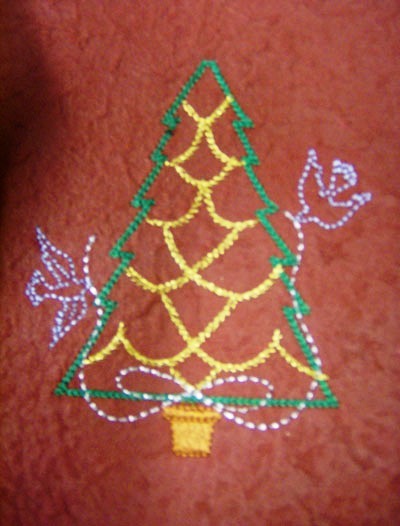 The fibers make it very strong and it holds stitches very well without any holes. (I used Stampin Up copper metallic paper and another gold metallic paper to layer this card. Your copper or card base should be cut to 6.5 x 11 and scored down the center (this will be shown later) and the gold piece should be cut to 6” x 5”. Holiday papers would be beautiful underneath, too. 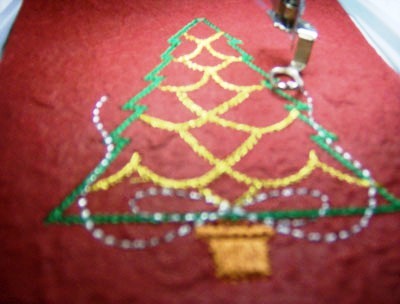 -Crystals, if desired, or other embellishments to add more decorations to your tree. The first thing you want to do is hoop your cutaway stabilizer. I used a heavyweight to be safe. 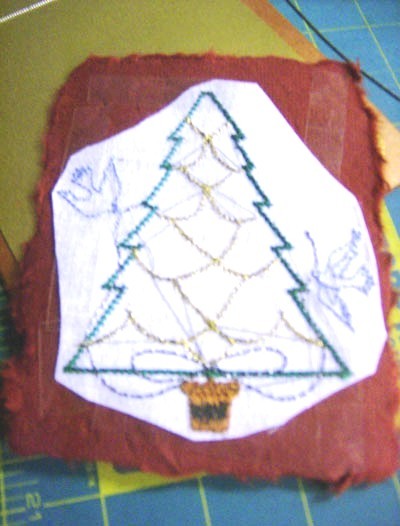 My particular card front/design filled the entire hoop, so I didn’t have to worry about centering the design. 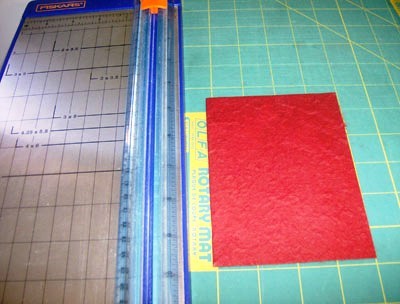 Using a paper cutter, cut your mulberry paper to a 5x7" piece so that it will fit inside your hoop. 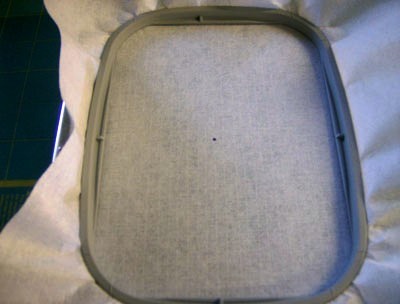 Place your hoop on the machine and lay your paper on top. Use spray adhesive on the back if you wish to hold it more securely. 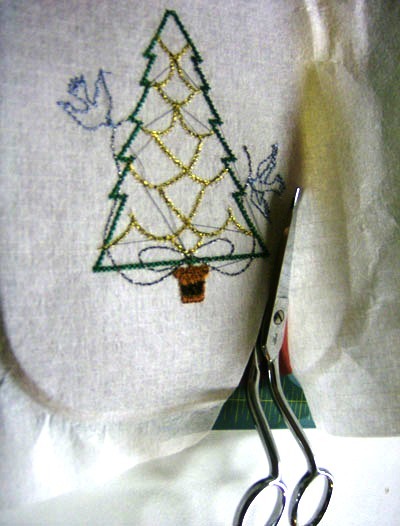 Begin stitching design as you normally would. I didn’t have any trouble with my paper shifting or moving. Clip threads as needed between colors. Here is our finished design. The metallic gold and silver look stunning on the card! 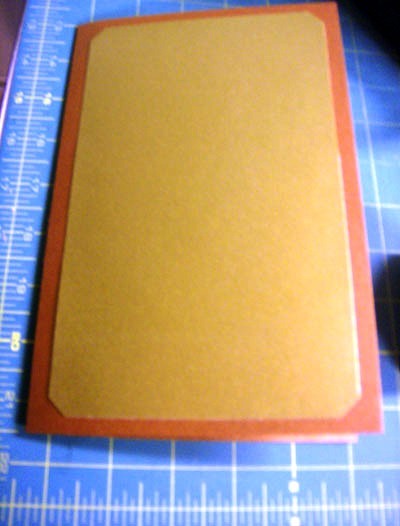 To make the card, I used a copper card base piece that was 11” x 6.5”. If you have never used a paper cutter, you use the measurements at the top to measure how large your paper will be once cut and then slide the blade up or down to cut your paper. You’ll notice there are two different colored blades here. On the left, the black blade scores the paper. It makes an indentation into the card stock so that it’s easier to fold and you get a nice crisp line. The orange blade on the right is a cutting blade. 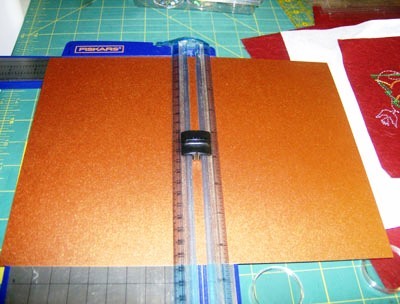 With your copper card stock, cut your piece down to 11" x 6.5" and then score down the center at 5.5”, using the guides at the top. 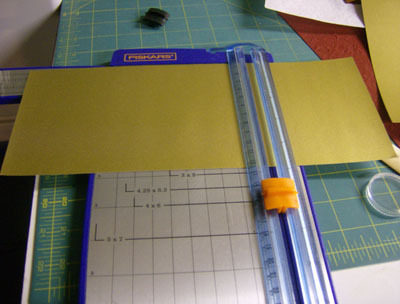 Cut your gold (or next) layer ½” smaller so that you can see the layer underneath – cut a 5” x 6” piece. To add another decorative element, I punched the corners off the gold piece. Next, add adhesive to the back of your gold piece of paper and carefully affix it to your copper card base. Use double-sided tape or a rolling adhesive like Tombow, to do this. 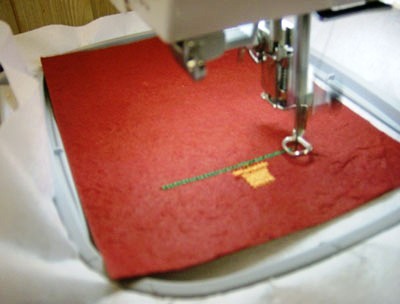 To get our embroidery design ready, we need to trim the stabilizer around the design being careful not to cut the paper. 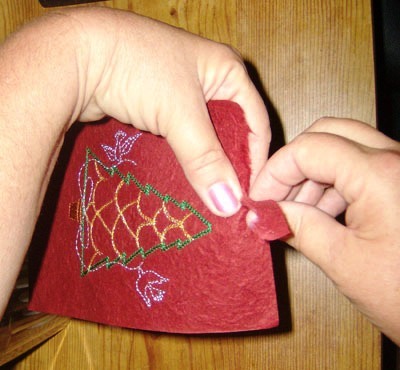 Using one hand to hold the edge of the paper secure and with control, use your other hand to gently tear the edge off the mulberry paper towards you. Once your paper is torn, line it up on your card base and make sure it’s the right size & no stabilizer is showing. 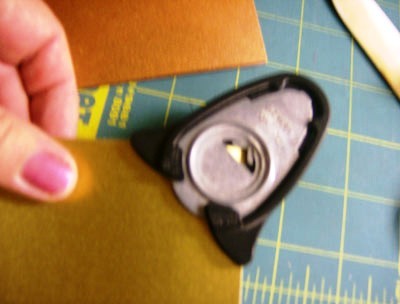 Apply adhesive or double-sided tape and carefully place on top of your card. I placed a piece of ribbon in between the layers and then pulled up and tied into a knot. It’s easier for me to make a knot to hold it in place, and then finish making it into a bow. It's looking good, but I think we need some bling! Let’s add a star on top and crystals! To apply your crystals, you can purchase crystals with glue on the back that are applied with a wand. Crystals are picked up with the wand and the glue on the back melts. You place the crystals where desired and press down to secure. 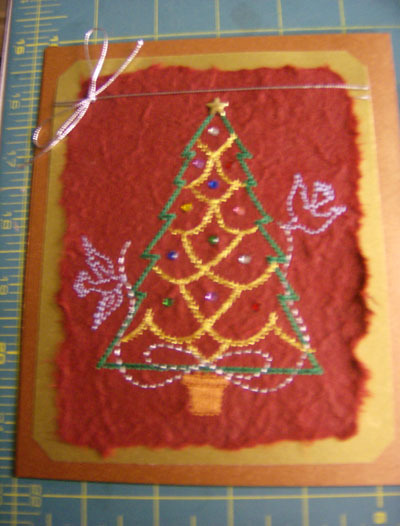 I used crystals that didn’t have glue on the back, so I used a jewelry glue with a fine tip to apply glue to the card and then used tweezers to place the crystals on the tree. E6000 is a very strong glue. You can dip your crystals in and then drop onto your card and push down to secure. 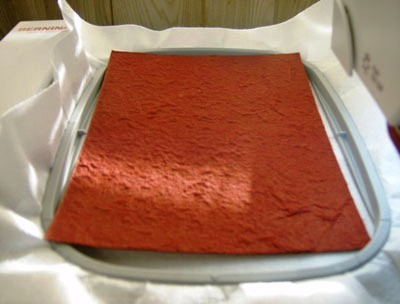 Another good choice is hypo-cement used for jewelry making. I love the fine tip! 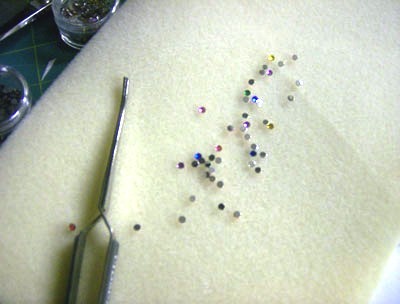 To place crystals, pick up with tweezers or your fingertip, dip in glue, and then place onto card. And here’s our finished card! I think the crystals add a nice touch and really make the card pop! 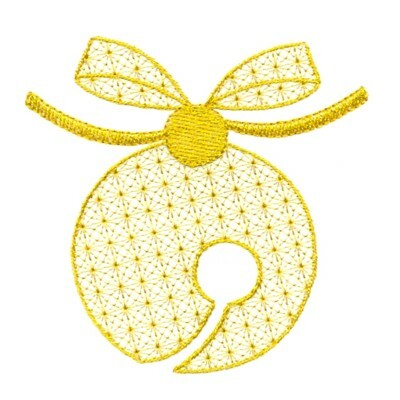 Debbie of Too Cute Embroidery is offering a Christmas ornament design to you for FREE!